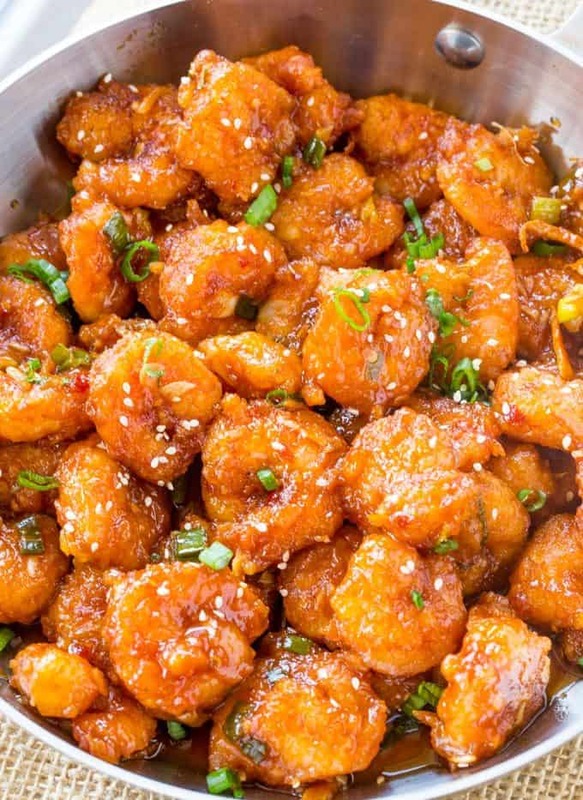 Honey Orange Firecracker Shrimp was a last minute swap for the Orange Peel Shrimp we were going to make last weekend (based on my P.F. 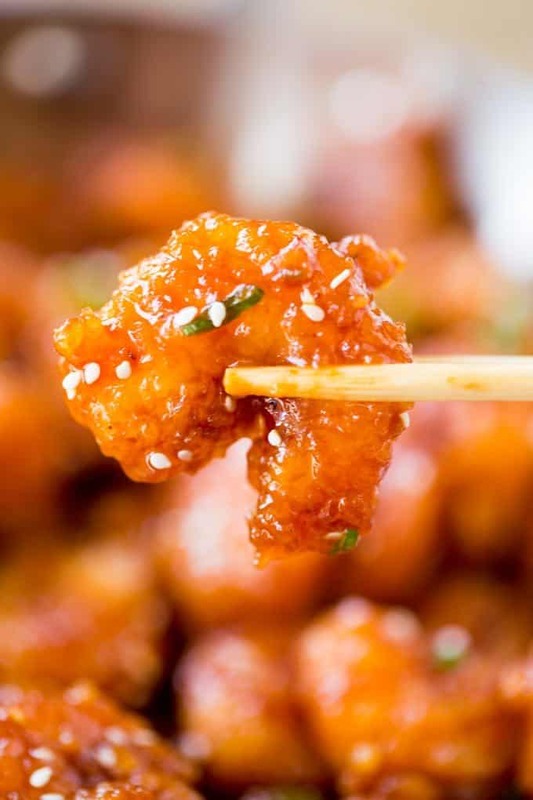 Chang’s Orange Peel Chicken recipe). Instead it turned out I hadn’t bought the tomato sauce for the recipe so I hopped onto AllRecipes to see what quick shrimp dishes I could make. 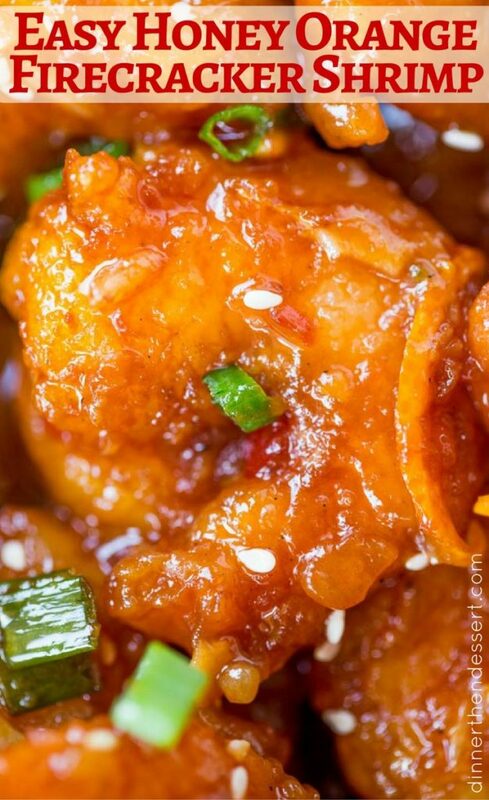 Lo and behold Honey Orange Firecracker Shrimp. It is so easy to make, the ingredients are all ones I have in stock at all times and it tastes…. AMAZING. 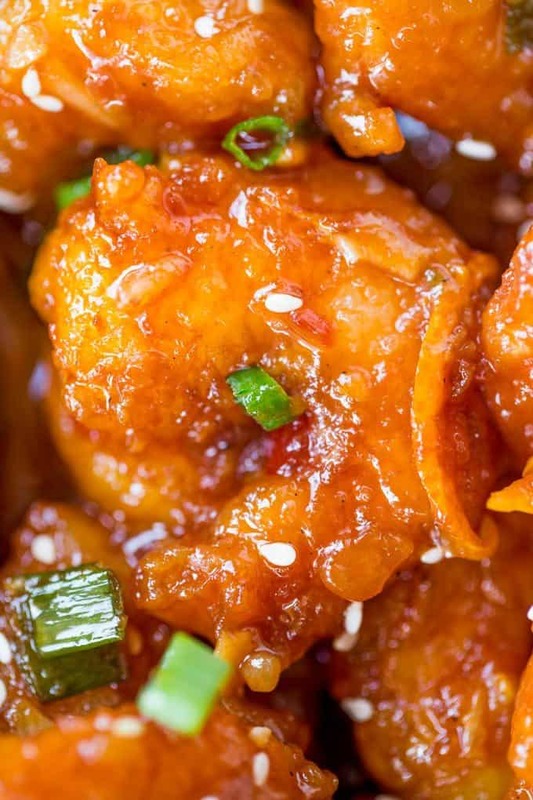 This may actually permanently replace Orange Peel Shrimp in our house! Add Sriracha instead of crushed red pepper, the creamy sauce will blend more thoroughly than the chili flakes. Add some steamed carrots to the pan, they would go great with the sauce. Roast up some vegetables on the side (375 degrees, 2 parts canola oil to 1 part soy sauce until browned). 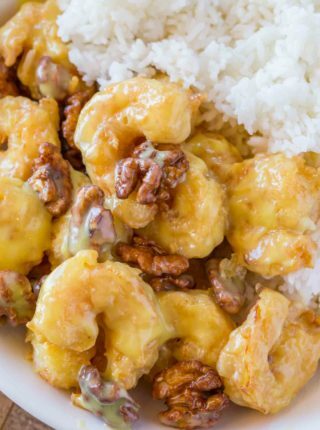 You can absolutely use chicken or pork in place of this shrimp. If you want a thicker coating dip the shrimp in flour, then egg and finally coat in cornstarch. Honey: The best deal on honey you’re going to find online that you know for sure is real honey, only $4 a pound. Or buy it in the store for even less! Citrus Zester: This zests the rind and removes the peel without the pith in perfect strips too, I LOVE this tool. 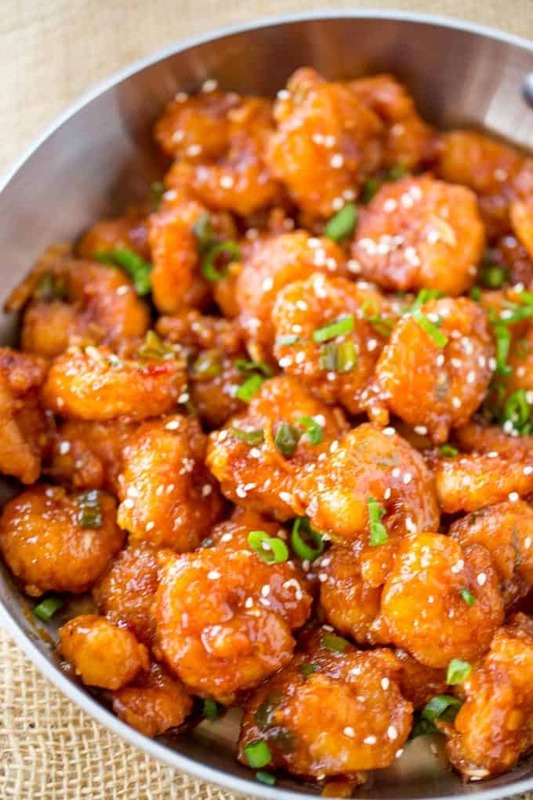 Honey Orange Firecracker Shrimp is sweet, spicy, sticky and crispy and so easy to make you'll throw your Chinese food takeout menus away! Just discovered your recipes & I’m in hog heaven! ; spent some time exploring recipes. Had this for supper. Excellent instructions (nibbled on some before the sauce & they were like popcorn shrimp). This was “Pa” approved! Only change made was using vegetable oil instead of canola. Thank you SO much for expanding my horizons! You’re so welcome! So glad he loved it! Larger shrimp was on sale this week, so that’s what I used. Size may matter in this case because “balance” was spot on with smaller shrimp. I proceeded as usual with larger shrimp, but later made another batch of the “sauce” and spooned over. I just love that citrus-y flavor. Also, (a note) – in our grocery store the sesame seeds cost more (per oz) in the spice isle than they do in the “ethnic” section. Thanks for the feedback. So glad you enjoyed it! 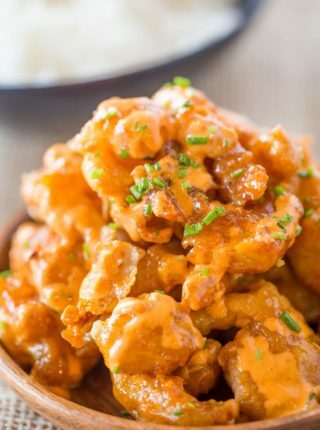 I love sriracha and definitely want to make the substitution. How much did you use? I would use a teaspoon. Enjoy! Yes, sometimes paying to have it all done is worth it. So glad you enjoyed it! 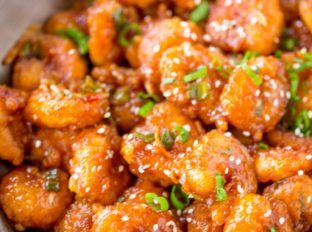 I am dying to make this recipe, but was wondering if I could double the sauce ingredients in this recipe. Do you eat these alone or service with rice, I’ve printed the recipe, so I will wait for a response before cooking it. But just reading the recipe alone, I would give it a 5 star rating. Yes, you can double the sauce if you’d like. We love this with rice, but you can serve it with a vegetable or even by itself. I hope you enjoy it! If using sriracha instead of crushed red pepper, how much should we use? Can’t wait to try this! A teaspoon is plenty! 🙂 Hope you love it! 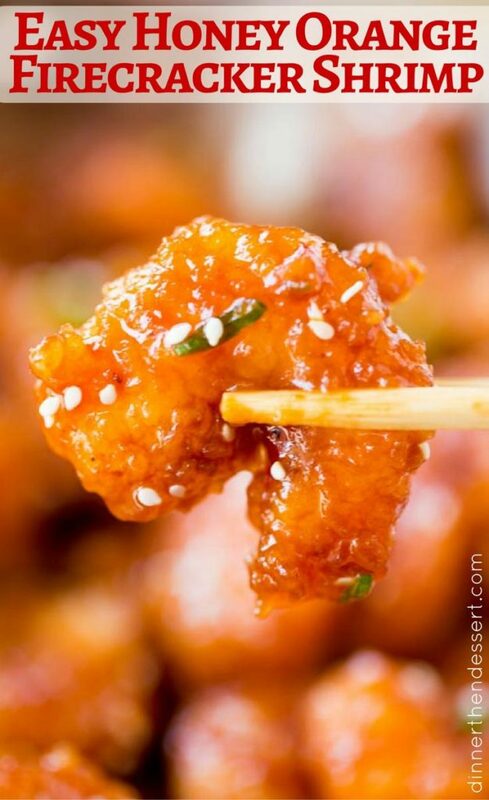 I absolutely love Panda Inn’s Sweet and Pungent Shrimp, this looks identical to theirs. I can’t wait to try it. Followed the advice of using sriracha instead of pepper flakes and also the suggestion to use flour, egg and cornstarch for a deliciously thick and crunchy exterior. Everyone who tried this was impressed, as was I. Thank you for sharing. Thank you so much Carl! I’m so glad everyone enjoyed it! Thanks for the 5 stars!! I did add some Mochiko rice flour to the cornstarch to give it a little more depth- I also drained the shrimp when they were done cooking on top of my grease splatter mesh (instead of a plate) to avoid any additional steaming. Amazing! I followed your marinate to a tee and it turned out perfectly. Lots of flavor! Thanks for the recipe! Awesome tips, thanks! So glad you enjoyed it! This looks delicious and i want to make it. My question is, can i use prawns instead of shrimp? Yes, essentially prawns are just big shrimp. Enjoy!! Would this recipe be okay with no cornstarch? It will still be delicious but it won’t be crispy. Enjoy! Would the leftovers be good for a meal prep? Or do you have to eat this same day? I always suggest eating shrimp the same day it’s cooked otherwise it gets rubbery after being reheated, sorry. This was excellent! I didn’t want it to be too sweet, so I used much less honey. I also added more orange juice and walnuts. The walnuts gave it another texture. Everyone loved it! Thanks for the suggestions, Anna! Hey is it cool if we use frozen shrimp that is already cooked? I wouldn’t use pre-cooked it could become pretty rubbery. Sorry for the delay in responding, it got snagged in my spam filter. I plan to make this recipe soon. My question is this, what does the corn starch do to the shrimp upon frying them? The cornstarch just helps the coating adhere to the shrimp and crisp up. Enjoy!! This was a delight to make and even more of a treat to eat! Thanks Nathalie! Glad you enjoyed it! This is delicious! Highly recommended. 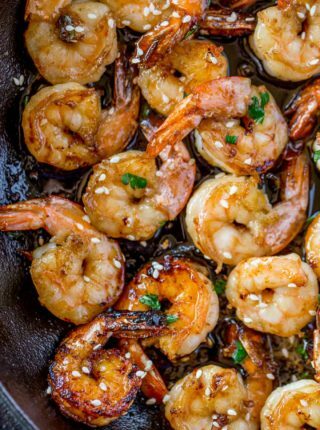 For anyone using a regular 12 inch frying pan to fry the shrimp, I recommend increasing the amount of oil to 3/4 cup. Using half a cup resulted in the last batch of shrimp having barely any oil to fry in. Good tip…glad you enjoyed it! I hate when I leave out an ingredient but glad it worked out with this dish! These look so perfect to me!! I can’t wait to try it!! I’d love for you to come back and let me know what you think after trying! I’m in love with this dish! Spicy-sweet is the best!! Yummy, that looks absolutely fantastic! 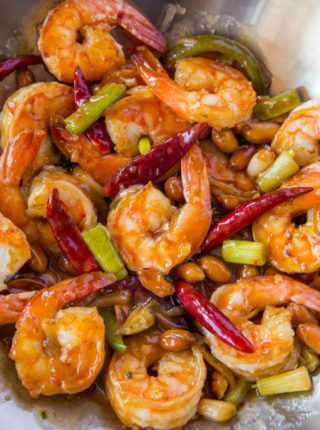 This is one of my favorite shrimp dishes!! YUM. I’m totally loving these flavors and how easy it is! 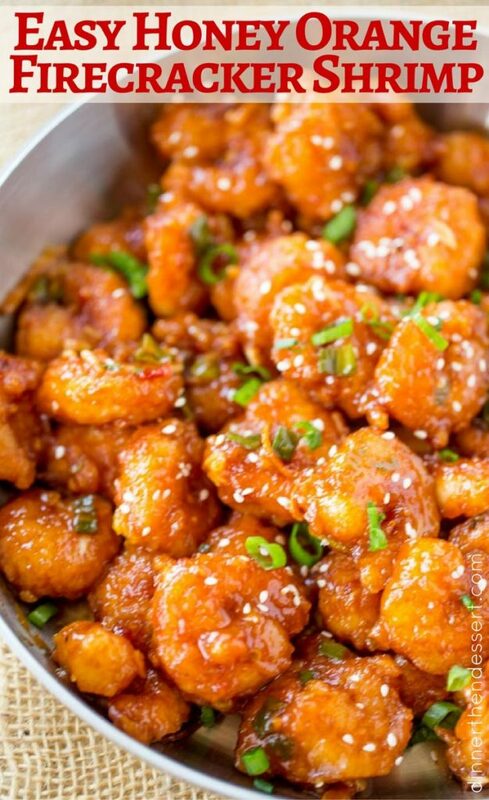 I love all the things about this dish: sweet, spicy, sticky & crispy! Can’t wait to give it a try! Delicious!